Diapering Essentials for Baby V! 4 Comments on Diapering Essentials for Baby V! Like all babies, I need several diaper changes in a day. Diaper times help to keep my bottom clean and fresh. Here’s what I’d like to share with everyone. At birth, the hospital provided a pack of Huggies Ultra diapers for newborns. Daddy and mummy bought Pampers (NB) and Mamypoko (S) too, and I was also very fortunate to receive Happy Blossoms from Mini Misfits /Mini Misfits’ FB for my diaper needs! Several of daddy’s friends recommended Mamypoko as it can hold for up to 12hours as claimed. True enough, it does! And since I sleep through most nights (I’m a good girl! except for the occasional nights I wake up a feed or 2 and scare them with my eyes wide open.. heh heh…), I don’t get disturbed for a diaper change which interrupts everyone’s rest. Mamypoko is rather thick, so it’s probably also the reason how it holds up? Pampers has proved to be good too and it’s much thinner, except for the strange obvious pee smell when it comes into contact with pee. Mummy gets a little paranoid sometimes, thinking that I’ve poo-ed so she starts sniffing at my bum. Checks reveal a wet diaper with no poo-poo, and that is quite a blessing too, so she doesn’t need to deal with the mess hehe! 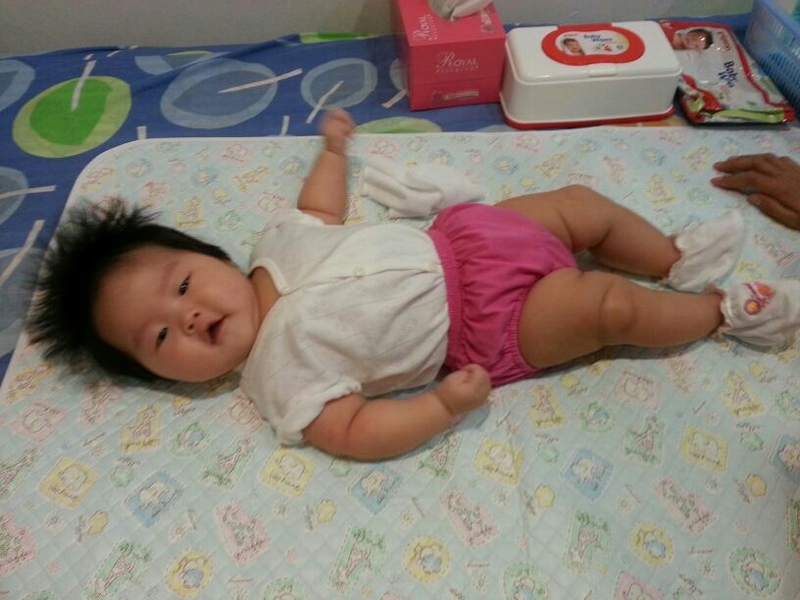 Korean diapers, Happy Blossom, is also a comfy choice! It’s not thick and pretty airy. Mummy likes it as it has a good fit between my bum and the diaper so i’m not “stuck” to it. There’s also a nice scent too. Check out mummy’s article on Happy Blossom! 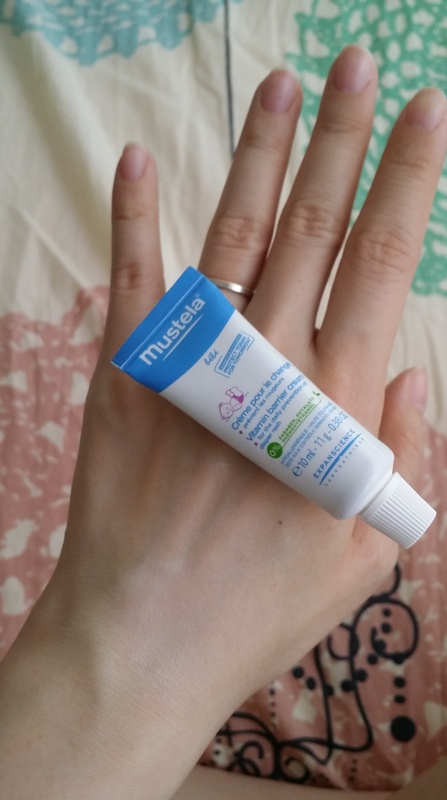 Many mums use Desitin Diaper Rash Cream, and after attending Mrs Wong Boh Boi’s ParentCraft Talk, she laments that most parents use that as a regular diaper cream even when babies don’t have diaper rash, which is rather strange. That made sense to mummy, especially since she was from the beauty industry – imagine using pimple cream on your face as a preventive measure instead of a solution?! We were very lucky to receive Earth Mama Angel Baby’s Baby Bottom Balm from Willow & Sage/Willow & Sage’s FB, which mummy and daddy likes! It’s easy to apply and doesn’t leave stains on my bum. It even comes with a nice calming scent from its natural ingredients which makes it a comfort to have on my skin. It comes in a tub and can last a long time. I’m happy to know that it has skin-loving organic ingredients such as olive oil, shea butter and lavender oil to keep my bottom feeling fresh. Pamper baby’s bum, or use it as a first-aid in the home for minor boo boos, burns and itchy rash. 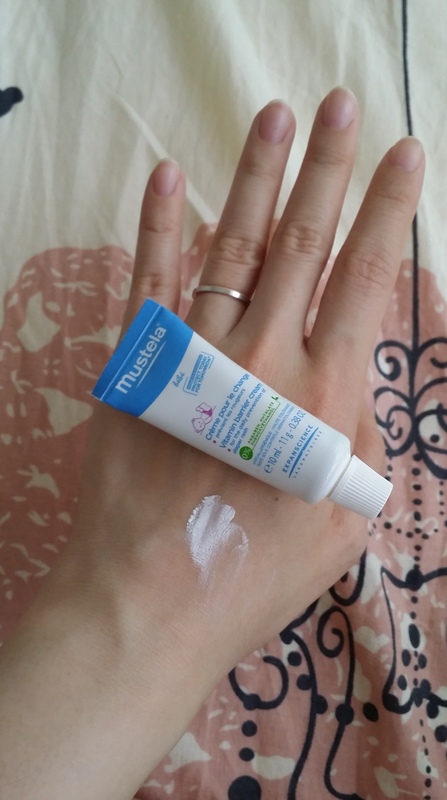 Trying out the Mustela Vitamin Barrier Cream. These make cleaning me up fuss-free. 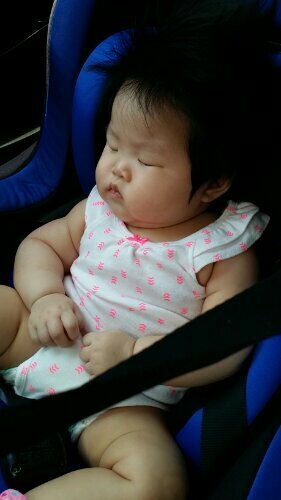 When I was still in mummy’s tummy, her good friend, Aunty X, told her that she should stock up on Kodomo wipes when they’re on sale at Watsons – 70 sheets, $2/pk, buy 10 get 1 free. That was exactly what daddy did – he actually bought 3 cartons of them before I arrived! Haha, daddy must be thinking I’d need that much. But hey, in fact, I used them up in less than 3 months *oops* And when they ran out, they went to get Pigeon ones which were more costly but bigger in size and had more sheets in each pack – 82 sheets, $19.90/combo of 6pks. Pigeon wipes are slightly more moist too, as compared to Kodomo. Their only grouse is that Kodomo sheets tend to stick to one another when pulling each piece out, and things can get a little clumsy especially when I poo. Hee. Mummy tried a sample of Huggies wipes which came banded with the newborn diapers from the hospital. Unfortunately, it was a disappointment. The sheets tore easily while being pulled out from the pack and mummy was using it to clean my poo when we were out so… that was quite an experience for us. Happy after a diaper change – smile smile! Daddy prepared Pigeon cotton balls ($3.30) before my arrival for those poo cleaning times to wipe my bottom with fresh water and reducing skin contact with wipes when at home. It is actually more comfortable and recommended too by Mrs Wong Boh Boi, as wipes although convenient, some babies may react to the frequent rubbing and the ingredients used in them. Not long after, daddy’s colleague says using those square cotton pads makes cleaning easier since they are larger but mummy doesn’t like using them. Upon contact with water, they become mushy and shrink, so cleaning gets abit trickier and she ends up using more pieces. 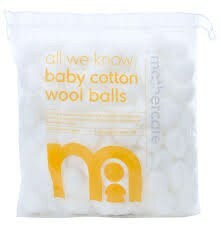 Mummy also bought cotton wool balls from Mothercare (they come in normal sizes $3.90 and extra large ones $4ish) and her vote goes to the Mothercare ones! They are slightly larger than Pigeon’s and being soaked in water doesn’t make them mushy. At the recent Babycare Expo, daddy bought Pigeon cotton balls ($2.65) since I’ll need them at mamak’s place (that’s how grandma likes to be called… hehe) too. Just to share, Mothercare is on Facebook, and they regularly post interesting bits. Changing mats are must-haves at home and when heading out. There are days when poo and/or pee gets onto them so having a few to rotate and standby is a must. Daddy’s friend gave us 2 Puku Puku ones in small and large size. Their material is abit “felt-like” and comes with a waterproof backing. Because of its felt front, it’s abit hard to remove poo unless it’s washed or soaked in detergent. We have gotten a few Tollyjoy waterproof ones so these make cleaning easy with a wet wipe if it gets dirty. Definitely need this.. to toss all the dirty diapers, used tissues and wipes, cotton buds etc. Mummy and daddy use a clean food container and bowl for my daily cleaning. During diaper times, one container is filled with warm water with a few cotton balls thrown in. They help to clean away my poo, especially when it’s a massive one. Always remember to clean from front to back, never the other way as that increases the risk of UTI. Mummy’s confinement nanny said that baby’s nails should only be cut after the First Month… well, it’s an old wives’ tale but anyhow, daddy and mummy took heed. But I think they were just afraid of cutting my nails when I was only a newborn… haha! Daddy took the brave leap to cut my nails on the morning of my Full Month party :) Mummy is still not-so-brave to-date :P Pigeon’s baby nail clippers are small and handy. Works comfortably even in daddy’s big hands. For parents or parents-to-be’s who would like tips on having an easier time during diaper duties, read more here. Also, babies are susceptible to diaper rash – find out how to prevent these skin enemies. Happy diapering, uncles and aunties!! :) Now, please excuse me while I catch a catnap.